An amazing lodge. Very well managed. Great touches such as free massages. We were upgraded to a suite room as it was our honeymoon and this really made our stay there special. Food was amazing. 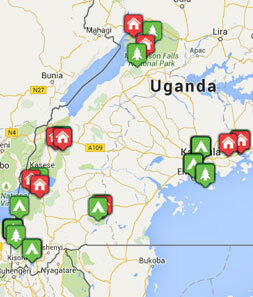 Would have liked to stay there for an extra night and done additional activities in Bwindi. Lovely camp with wonderful food and customer service. Idyllic setting. We really liked the evening we 'ate out' next to the fire on the banks of the river. This was the least special of all the places we stayed. Room was shabby and place was impersonal. Would rather have stayed in another smaller lodge. We didn't know the Boma had a pool from the info provided by Tribes. This was a very welcome bonus. They treated us to a bottle of Amarula for our honeymoon which was very gratefully received. Food was very good particularly the Avocado starters. "Setting off on our gorilla trek prepared for a long walk and also prepared for the possibility that we may not even see them only to see them 15 minutes in! A wonderful and memorable hour which we will never forget." "Part of our trip included a boat trip on the Kazinga Channel. Having been excited earlier in the trip by the siting of a hippo's eyes above a swampy pool, nothing prepared us for the hundreds of hippos and abundance of bird life. It was a photography dream!"